International Polka Music Hall of Fame Richie Gomulka! International Polka Music Hall of Fame® Richie Gomulka is featured on this CD. 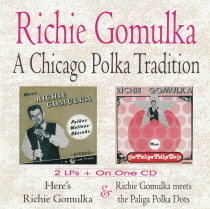 “A Chicago Polka Tradition” is the title of the CD with Richie Gomulka. This Vintage Collection is 2 LPs on one CD with some bonus tracks!